Jetpack is a word press plug in which will supercharge your word press website or blog r as creamed with the super power from wordpress.com that will upgrade the stats of your word press. It clubs number of wordpress.com plug in into a single package. You can install the same on your self hosted blogs or your self owned website. It is a must for all the serious bloggers out the there. 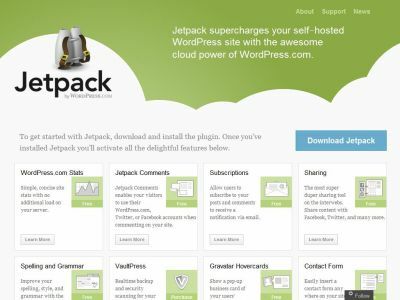 Jetpack has got eight distinct features and you can take advantage of all of them. The word press stats feature makes the plug in worth to download. With this you can track every single thing as far as the traffic goes. The display shows the daily stats page. The stats that are displayed on the page inside the jetpack plug in are first the “Refers” which is a list of all the websites that referred traffic on your website today. The second one is the “search engine terms” which is a list of all the keywords that were searched and arouse the traffic. It is great for tracking the long tail keyword that you are ranking on. The third one is the “top posts and pages” in which the top ten posts and pages that are visited today are displayed. It also gives you the information regarding how many hits each single post has got individually. This stat can be used by you to calculate conversion rates for your capture pages. It will be really beneficial information for any kind of marketing. The forth one is the “clicks” it is a one more key component for tracking which gives you the links that are clicked on your website everyday. And also gives you the information about the number of times each link was clicked. So now as you know the advantages of it go grab it.